The Institute of Acoustics is one of several professional bodies licensed by the Engineering Council to register members as professional engineers. Through our Engineering Division, suitably qualified and experienced engineers may gain this internationally-recognised award. For CEng and IEng registration, candidates are required to present evidence of their professional development and responsible experience for consideration at interview. Members may draw on our on-line services for support in developing, recording and authenticating their professional development in preparation for the Professional Review Interview. There are two routes - the "standard route" for those holding an accredited engineering degree listed on the Engineering Council website https://www.engc.org.uk/education-skills/course-search/acad/ - and the "individual route" for those holding degrees in related subjects such as physics, or unaccredited engineering degrees. Many of the successful Institute of Acoustics registrants are graduates of one of the acoustical engineering degree courses at ISVR at Southampton University or Salford University. 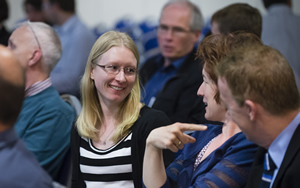 Because of the nature of the acoustical engineering profession, the Institute recognises that many of its members seeking CEng or IEng registration will need guidance and assistance in developing the evidence to demonstrate that they satisfy both the educational and the professional development requirements. Members seeking advice should contact the Institute at acousticsengineering@ioa.org.uk. Members seeking to achieve registration are given personal advice and support through the process. Interviews are carried out under the Engineering Council UK-SPEC procedures, which require more work by candidates in preparation, but also make the process more straightforward by setting very clear criteria for the assessment of professional experience. http://www.engc.org.uk/ukspec provides further details and a downloadable PDF file for professional engineer requirements. The Engineering Division is one of the standing committees of the Institute of Acoustics, whose primary role is to promote Engineering, and to facilitate the registration of suitable IOA Members as either IEng or CEng. Preparation of materials for registration is a meticulous yet rewarding process of articulating competency against the requirements of UK-SPEC, and many candidates decide that they are not ready or able to undertake the work of preparing the papers required when the guidance notes first arrive. Experience has shown that most candidates benefit from being mentored through the process, where help can be gained in understanding the requirements, completing the paperwork, and preparing for the face to face interview. Some candidates will be able to find mentoring support from within their own organisations, other registrants that they know, or even clients who may even be registered through another Institute. The IOA recognises that this is not the case for all candidates however, and keeps a database of willing mentors who would be prepared to assist candidates where needed. This is on top of the one to one support provided by the Engineering Division Manager prior to interview. When candidates are nearly ready for interview, their paperwork will be reviewed by members of the Engineering Division Committee prior to an interview date being agreed. Also, where candidates are unsuccessful at the first interview, one to one feedback with one of the interview panel members is offered to help guide candidates towards a resubmission at the appropriate time. In the first instance, contact with the Engineering Division should be made through acousticsengineering@ioa.org.uk, and the IOA will aim to match a candidate with a suitable mentor. In the event that a suitable mentor cannot be found (for whatever reason), the IOA will endeavour to provide ad-hoc remote support where possible.